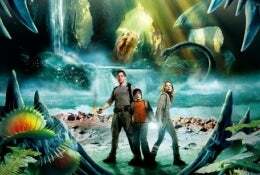 Click to viewWe may have liked the remake of Journey To The Center Of The Earth more than we expected, but here's something we don't like so much: 130 special effects artists who worked on the movie have been forced to take the producers to court - and worse yet, involve star Brendan Fraser - to try and get the $1 million they're still owed for their work on the underground adventure flick. Brendan Fraser, star of the 3D action film that has grossed more than $102 million U.S. worldwide to date, has even gone to bat for the former Meteor Studios Inc. workers by making personal calls to the shareholders of the local company, which filed for bankruptcy in March. "Discovery Communications held a passive non-controlling shareholder interest in Meteor Studios, an independent company incorporated under the Quebec Companies Act," Katie Wolfgang, vice-president of international communications at Discovery, said in an email from her Maryland office yesterday. "All matters related to the management of Meteor Studios, its employees and operations have been handled directly by Meteor Studios principals since the inception of the company." Evergreen spokesman John Hernandez wasn't available for comment at the company's Denver headquarters.